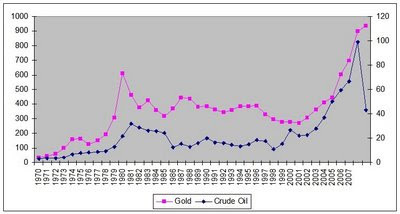 Below is a quick chart comparing the prices of gold and oil from 1970 to 2009. The price of gold in US$ is on the left vertical axis and the price of crude oil in US$ is on the right vertical axis. Its interesting how similar the trends are. Why the two might follow similar pricing trends is a good question that I might examine in a following post. Historical crude oil prices were found at the Energy Information Administration website for Annual Energy Review. I used their data for Crude Oil Domestic First Purchase Prices, 1949-2007. Then for 2008 & 2009 numbers I used their short term energy outlook page.